Be the first to share your favorite memory, photo or story of Harley. This memorial page is dedicated for family, friends and future generations to celebrate the life of their loved one. 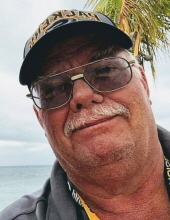 BROOKLYN-Harley Ray Lemke, age 64, of Brooklyn, passed away on Friday, Feb. 8, 2019, unexpectedly at home. He was born on Sept. 17, 1954, in Madison, the son of Kenneth and Delores (Schroeder) Lemke. Harley met the love of his life, whom he adored, Alta "May" Schulz at 17 years old and they were blessed with two children. His children were his pride and he was both a provider and a fierce protector. Harley loved his Harley and the outdoors. He had an affinity for smoking meats, fish, and anything else that he thought might taste good. His creations were sometimes very innovative but hardly edible. Harley was a man of few words, but you always knew where you stood with him. Harley worked as a Correctional Sargent for the State of Wisconsin. He was a veteran of the U.S. Army and served in the Berlin Brigade. He was proud to have served in Germany and guard the iron curtain. Harley is survived by his life-long partner, Alta "May" Lemke; daughters, Kaytee (Pelon) Cornejo-Lemke, and Karley (Bruce Crubaugh) Lemke; siblings, Edward (Joan) Lemke, Sharon (Tom Meyer) Hansen, Julayne (Richard) Anderson, Ginger (Brian) Dreher, and Kendel (Pam) Lemke; grandchildren, Hayden Lemke, Jase Miller, Selena Cornejo-Lemke, Claudia Cornejo-Lemke, Yasmin "Yaya" Cornejo-Lemke, and Nathaniel Shilts; mother-in-law, Janice D. Schulz; grandmother-in-law, Alta Mae Schulz; sisters-in-law, Jackie (Alan) Tomlin, and Tammy (Terry Haug) Pestor; brother-in-law, Gerald (Carol) Schulz, Jr.; son-in-law, Brad (Maria) Shilts; and very special friends, Brad Tarkenton, Tony Packard, and John Thompson. He was preceded in death by his parents; father-in-law, Gerald Schulz, Sr.; grandson, Johnathon Lemke; granddaughter, Natalia Cornejo-Lemke; and special friend, Barry Tarkenton. A private farewell will be held at GUNDERSON OREGON FUNERAL HOME, 1150 Park St, on February 16, 2019, from 11:00 am until 1:00 pm. Family and Close friends are welcome to join. A memorial service will be held at the ANCHOR CLUB, 112 Hotel St, Brooklyn, at 2 p.m. on Saturday, Feb. 16, 2019. Memorials may be made to the Oregon Sportsman Club for Hunter Safety Classes to be provided to the community. Online condolences may be made at www.gundersonfh.com. "Email Address" would like to share the life celebration of Harley R. Lemke. Click on the "link" to go to share a favorite memory or leave a condolence message for the family.